These purses are made from vegetable tanned goat skins that have been dyed using period dyes. They have decorative piping in the side seams and are made entirely by hand. The design for this purse comes from a surviving example in the Bayerisches National Museum and is a common style in the 16th and 17th centuries. They hang from a leather cord and the main section is large and lined with soft chamois leather. There are also four outer pockets each with it's own drawstring. They measure 7 inches wide and 7 inches long (18 x 18 cm) when open. 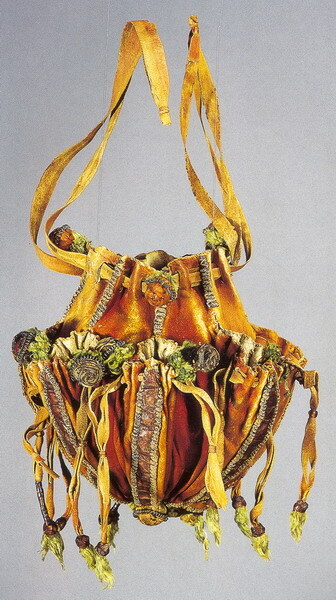 A surviving example of this style of purse in the Bayerisches National Museum.